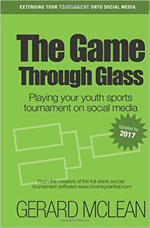 Whenever we sign a soccer tournament that is just launching, we get asked a lot about how to get a lot of traffic to the web site that converts into team applications. While each soccer tournament event is slightly different, here is some of the collective advice we usually give out. First year tournaments are really difficult. There is usually a lot of offline hustle with the club coaches, within the league and at the state association level. Your club name will probably be the best thing to help you. Can you send out an email from the club list list? Also, make sure everyone in your club knows the website for your tournament. Every coach, every volunteer, every parent. Nothing says “dead lead” like someone from the club who does not know the web address. Make sure your TourneyCentral website is as complete as possible. That means your about page, rules, hotel policies, front page news, frequently asked questions are all full. It is a lot of work, but considering you only have about three seconds before a team will decide to click off your page or explore more, it is worth the investment. If this is a second season tournament event you are starting up (Spring and Fall) generally established clubs with two events should cross market. The relationship and permission to do that would be on your end. We are staunch believers in each event owning their own data, so we do NOT ever market one event using the other’s teams. But we encourage cross-pollination within the TourneyCentral family when it makes sense. Postcards to the state and neighboring states is a good way to market as well. Everyone is doing so much online stuff that new events just get lost in the flow. A postcard in the mail stands out. Be sure to stick to a three second message and avoid edge-to-edge words. A strong photo, the who-what-where-when should be clearly stated up front and then push to your website. Your best marketing efforts are with trusted partners like your state association and club. Once you establish the first year — and you do a good job — you’ll see some online traction. Also, target the states that you want to draw from and contact these state associations to see what they have for advertising or direct mail options. Become a member. Get involved. Seek help in their forums and learn from the tournament directors who are willing to teach. http://www.backofthenet.com if you are looking to attract East Coast teams.. Larry Miller, good guy. Set up a Facebook Fan page and search within your target markets. That is not quite as effective, but it is gaining traction. Also, set up a twitter account. be sure to add these to your TourneyCentral admin so they show up on the sidebar and link up to your scores and news. Be sure to post any news to your Facebook and Twitter accounts. There is no magic formula, just hard work.